Welcome to my Blog! I'm Nancy Scott of Masterpiece Quilting and I'm excited to be part of this elite group of bloggers bringing you the "My Happy Place" Row Along. You can get to know me on my About Me page. Today I want to focus on My Happy Place row. This theme was a challenge for me... I guess I don't think much about where "my Happy Place" is or what it is :) But everyone who knows me knows that I love Antiques so it made perfect sense to use that as the theme for my row. My favorite antiques are quarter-sawn oak and walnut furniture as well as depression glass, ironstone china, Ruby Red glassware, blue canning jars and of course, antique quilts! I credit my love of antiques to my father, who was always refinishing antique furniture, and an amazing lady named Bernice, who was a dear family friend. I loved going to her house because she had more antique furniture than anyone else I knew! So without any further adieu - here's my row! First of all - huge thanks to Northcott Fabrics for graciously providing the fabrics to make this quilt. I used fabrics from their Artisan Spirit collection. And huge thanks to The Warm Company for supplying me with their Warm 80/20 batting and Steam-A-Seam 2 Fusible Web. I pieced the partial Dresden blade and Wedding Ring arc and then use raw edge fusible applique to attach then as well as the letters to the background fabric. Each piece was secured using matching thread and a machine-blanket stitch. The pattern is available for FREE until October 11, 2018 in my Craftsy store. After that, the price will increase to $5.00. And what's a blog post without a giveaway or two or three! From Moda - 2 Moda Collector Tote Bags valued at $15.00 each. Shipping is the responsibility of the winner. And from Masterpiece Quilting (that's ME!) 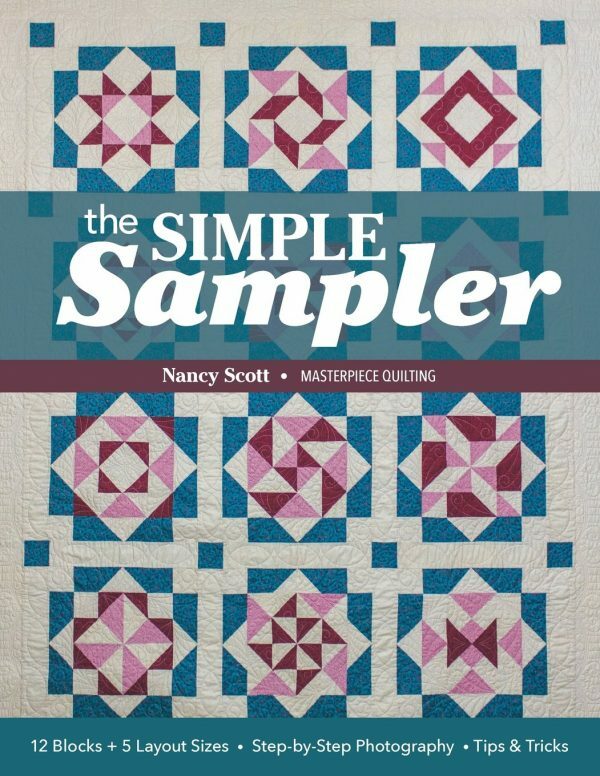 - 3 copies of my new book The Simple Sampler valued at $17.98 each. I will pay shipping - international too! In case you aren't one of the lucky winners, you can purchase a copy on Amazon. 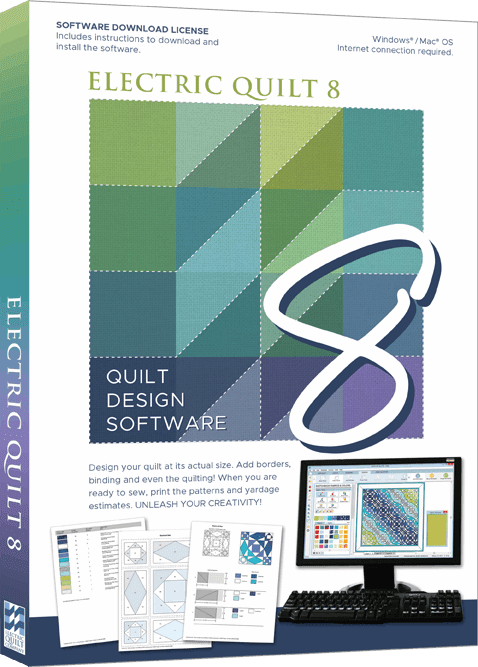 And from Electric Quilt - Electric Quilt Version 8, a $239.95 value! The shipping will be a Coupon Code Via Email. Thank you for stopping by and visiting my blog. Be sure to visit the other bloggers participating in the My Happy Place Row Along. I've seen previews of many of the rows and they are simply beautiful! Labels: 2018, Masterpiece Quilting, My Happy Place Row Along, Northcott Fabrics, Seams To Be Sew, Steam-A-Seam 2, The Warm Company. A lovely row. I must admit to enjoying the hunt of my favourite collectibles. Thanks for share. I love it. I'm old so I really like Dresdens. Thank you for your lovely row that you are sharing with us. It is beautiful. Great Row! I know a lot of people that would love to have one of these! I love your row! I know several people, myself on occasion, that consider antique shops their happy place! 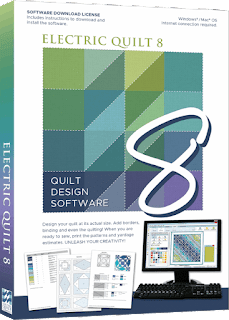 O love sampler quilts, so your book is right up my alley! Love your row, too. I have several family members that this would be perfect for. I always love your fun ideas. Thank you. Love your row. You have so many fun patterns. I enjoy looking at antiques, whether it's in an antique shop or in a museum. Thank you for your row and for your giveaway. Lovely row! Thanks so much for sharing your happy place! Awesome row! Thanks for sharing! Nice job. Thanks so much. And thanks for the book giveaway as well. Love your row. Thank you. Perfect row for antiques! Thanks for sharing. I spent many weekends growing up antique shopping with my parents. This is one I may have to make for their house. I know they would love it! Very cute quilt! I love the little Dresden Plate. Thanks for sharing your quilt. Lovely row! I was never an antique collector but my husband was and we use to spend Saturdays looking from one shop to another. Thanks for sharing. Very pretty row. Anything with a Dresden! Thank you. Your choice of blocks perfectly matches the "antique" feel. So nicely done! I love the quilt blocks that you included. I'm not much for antiques (my parents were big antiquers and I got burned out being dragged to places as a kid) but I love the idea of using this row and swapping in the word "quilts"! Thanks for a beautiful row! Antique shop is a WONDERFUL happy place. Thank you. I love your row! I grew up with antiques, my dad also refinished antique furniture and had a "booth" in an antique store. He has passed on but most of my siblings carry on with our love of antiques. Thank you for sharing! That's a neat idea! I love your row. 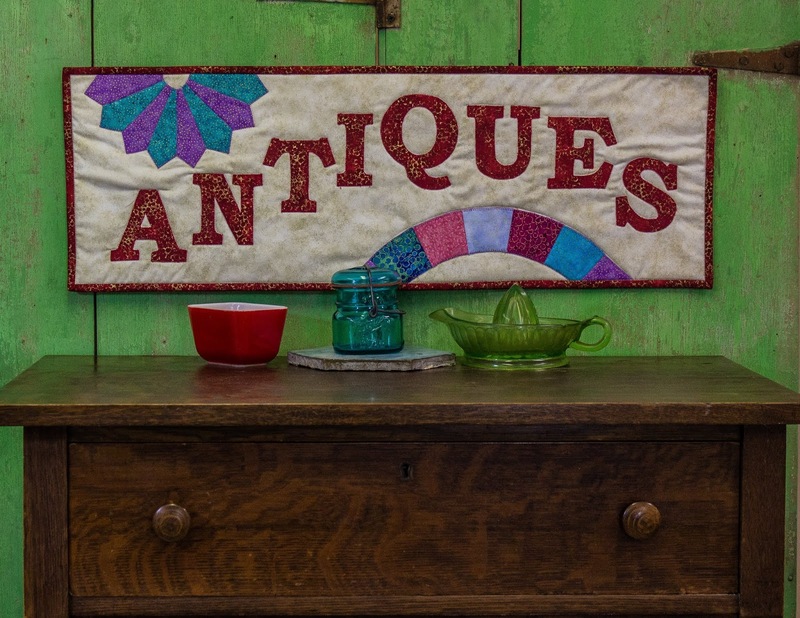 Although it says "Antiques", the partial quilt blocks make me think of antique quilts. And that is a VERY happy place for me, too. Thank you for a lovely row. This row is really beautiful and would look lovely hanging over any piece of antique furniture. I love it! I enjoy looking at antiques. I have a few from my grandparents. What a cool and fun way to show off your love of antiques! My father always stopped at antique shops when I was a kid and how we all hated looking at that old stuff! Now, I really enjoy wandering through those shops and look for pieces that are reminiscent of my grandparents' things. The colors in your row are great! 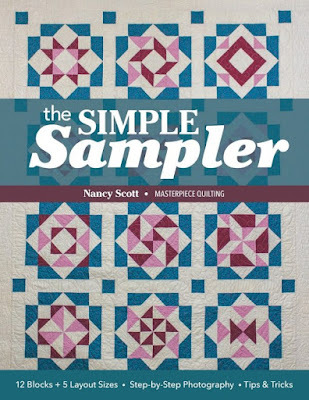 The Simple Sampler would surely help me learn to sew 12 new blocks! You and I are kindred spirits! Quilting, antiques and family are my three greatest loves. Enjoyed your blog and getting a chance to meet you! I love antiques also, thanks for a great row. Great row! Thanks for sharing it with us. beautifull row! Thanks for sharing. Love your row! I love antiques too. Unfortunately, my daughter, my only child, is not into them so I don't know who will get them when I am gone. :-( Thanks for sharing your row!